Written by SCOTT SNYDER & STEPHEN KING ? Art and cover by RAFAEL ALBUQUERQUE 1:25 variant cover by J.H. WILLIAMS III It's high noon for the American vampire as Pearl Jones faces off with the coven that ended her human life and Skinner Sweet gets the showdown he's been demanding for the last 20 years - with his old adversary Marshall James Book. 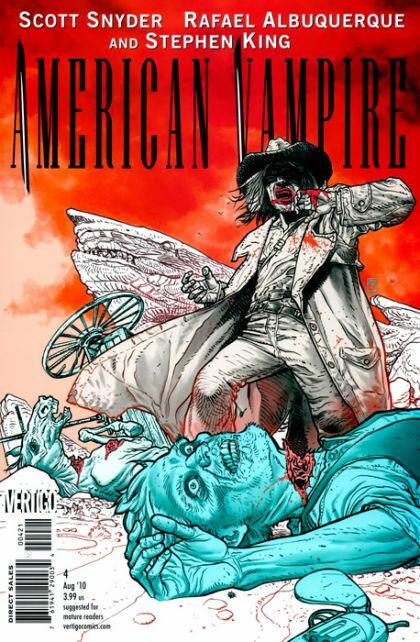 Scores will be settled in this extra-sized issue of AMERICAN VAMPIRE, with stories by author Scott Snyder and the master of horror himself, Stephen King.